The dispatch center is a primary answering location for all wire-line, wireless, and VOIP (Voice Over Internet Protocol) 911 calls for all of Porter County. All the Fire Departments in Porter County are dispatched from this facility. This center has satellite weather service monitoring and one of the Porter County emergency siren activation control units to activate all the emergency sirens on the system around the county. The Dispatch Center itself is entirely computerized with systems that includes Tiburon dispatch software, mapping system, IDACS / NCIC, Motorola Gold-Elite radio consoles and Cassidian (formally Plant / CML) Sentinel 911 software. Enhanced 911 imports automatically to the dispatcher's computer screen with the caller's wire-line phone information or cell phone number. 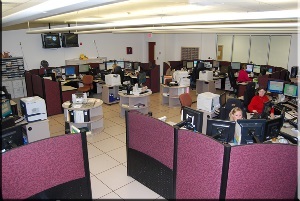 In addition, dispatchers also operate the mobile data system allowing computerized communication with police cars, fire vehicles, and emergency medical vehicles.